We don’t usually make a big stink about birthdays, but we’re coming up on our 5th, and it just seemed wrong to not throw a party. While we have multiple events and surprises planned for the weeks leading up to our actual birthday (June 18) and beyond, this is the big one — a celebration of food, friends, music, and community at One Longfellow Square on Saturday, May 24. Some of you may have seen a little three-piece band from Toronto called Elliot Brood at OTTO’s Munjoy Hill location about 18 months ago. And if you were ever in our original slice shop back in the day, chances are you heard Elliott Brood blasting while we cranked out pies. You might even say they fueled a lot of what we have built over the past five years. 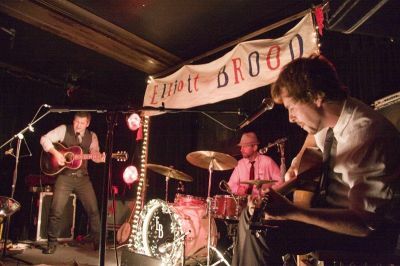 An absolute favorite of OTTO owners and staff, Juno Award-winning Elliott Brood is a powerful three-piece specializing in an artfully unique brand of alt-country guaranteed to move you — physically and emotionally. Whether churning out urgent, boot-stomping sing-alongs or lyrically-rich soot-stained ballads, these guys are the real deal. You really don’t want to miss them. We’re thrilled that they agreed to be part of our celebration. Sharing the stage will be Sympathy & The Lion, an alt-folk duo out of Lancaster, PA. There will be giveaways, prizes and other surprises. Get your tickets now. It’s gonna be a good time. This entry was posted in Music, Uncategorized and tagged birthday party, Elliott Brood, live music, Music, one longfellow square by elshepherd. Bookmark the permalink.